Color flow icing was something I wanted to try for a long time now. Before making it from scratch, my curiosity led me to my favourite store - Michael's, to my favourite aisle, Wilton. However I ended up buying the Cookie Icing bottles. I did not follow the instructions of microwaving the icing, but used it as is, transferring it to a piping bag. Results were not too bad. Took me some time to get the hang of it, but once I did, armed with a toothpick in one hand and the piping bag in another, there was no stopping me! 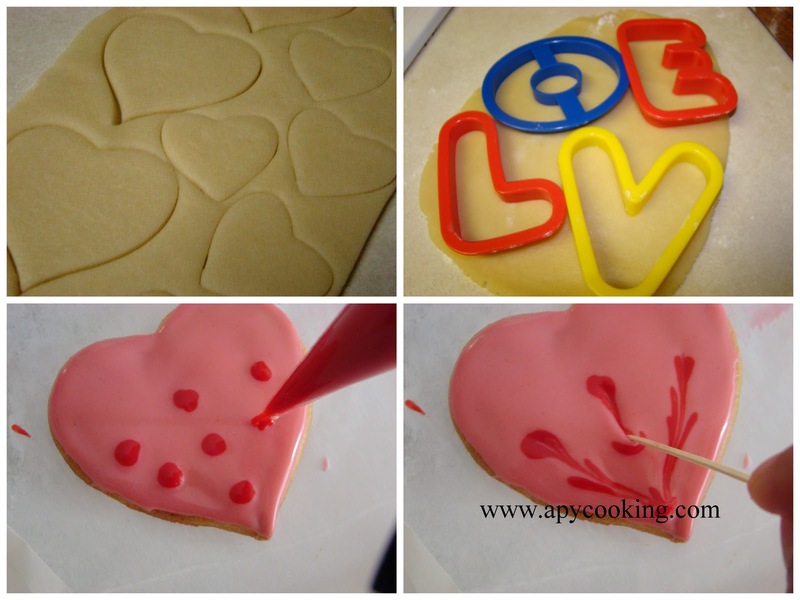 For the cookies, I used Alton Brown's recipe which I used to make the Halloween Cookies earlier, using heart shape cutters instead of the pumpkin cutter. To get the step-by-step pictures go here. 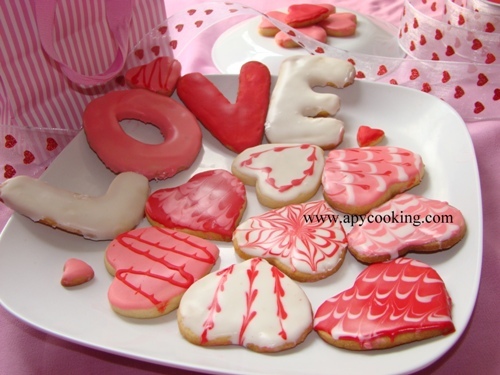 Cookies look so cute, colorful and yummy. A very happy valentine day to you. 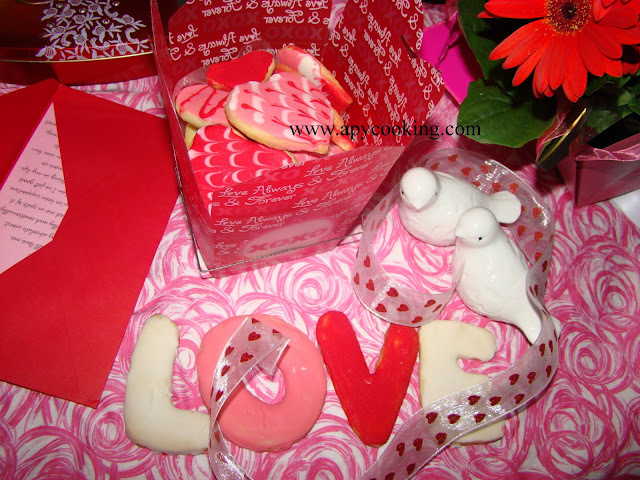 Thanks for spreading love though these cute hearty cookies! Happy V day to you. Happpy valentine's day, those cookies looks soo cute,elegant.. These attractive cookies just dragged me towards to your blog straight from my dashboard, great job. Looks very very cute. These are adorable! I love the colours you've used. happy valentine's day, awesome cookies. wow, beautiful looking cookies dear. Happy V day to you too. Wow! Definitely impressive! Good job! Oh wow! 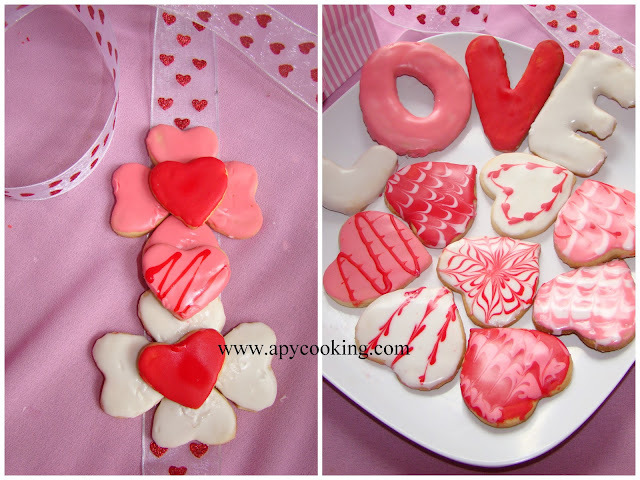 Love that shading & icing on the cookies ... especially the flower pattern in the center of the plate ... so creative!